Exactly two months ago, I was in the hospital recovering, after have two discs in my neck removed and fused. The journey to get to surgery was a grueling, four year long battle with doctors and pain. Never once during that trial did I consider the pain to be JOY. Most of that time was spent living as a prodigal, enslaved in an affair that lasted for many years. Those who have never experienced or endured chronic pain have a hard time understanding how someone can sit around and do nothing all day. They call it lazy. They call it undisciplined. They don't understand how hard it is to even sit up in the morning, much less get out of bed and try to get through another pain-filled day. It is extremely frustrating to try to keep up with day-to-day activities, like cooking and cleaning. Don't get me wrong. I hate cleaning, and I loathe laundry. But I love cooking, and I used to be able to spend 5 hours scouring my house from head to toe (whenever someone was coming over). It was very fulfilling to be able to accomplish such an incredible feat, especially when the kids were younger. Now the kids are old enough to help out around the house, and so those jobs that I literally became incapable of doing, they have learned. Until a couple of years ago, Kris would have to pick up my slack. My neck got so bad that I couldn't stand up for more than a few minutes at a time. Standing in church during the songs was barely possible, which meant that cooking or doing anything that required more movement than standing was not possible without extreme pain. The herniated discs had been pressing on my spinal cord and it was causing severe pain in my lower back and legs as well. So, the house was never cleaned the way I wanted it to be. Some things you just can't teach a ten year old child. Or at the very least, you can't expect it to be done the way your obsessive mind wants it done. So for a very long time, the house was barely clean enough (by my standards) to have company over. It was embarrassing, because I believed my friends and family would come in and judge me as a mother and keeper of the house based off of the dust on the TV and the spider webs in the corner, or the floors that were never perfectly swept or vacuumed. Most surfaces are consistently covered with books, school papers, or other miscellaneous things. But due to the amount of pain I was in just sitting still, I had to come to terms with the fact that my house was not going to be that clean, pristine model home. Throughout this entire journey to find healing from physical pain, more often than not, I found myself frustrated. With myself. With my husband. With my children's valiant attempts at "cleaning." I didn't question God during this pain. I didn't ask WHY I was in so much pain. I just accepted it. After I came home, after choosing to honor my covenant vow to my husband, I continued to just "live" with the pain. Some days were so bad that I was just angry at everyone and everything around me every moment. It conflicted with my desire to grow closer to God and become the godly woman that He was calling me to be. It interfered with my life. Once I began working last October, it interfered there as well. Some days, instead of work, all I could focus on was the pain. Other days, I would grit my teeth and bear it. And when I got home, the last thing I wanted was a kid or husband touching me, wanting or needing energy and strength I didn't possess. While I was growing leaps and bounds spiritually, I never did learn how to let go of the pain. While I had been released from the captivity of adultery and living in fear, I was still anxious. Though I walked out my marriage vows each day and grew closer to my husband than I ever thought possible, I held on to the pain. How could I let go of something that refused to let go of me? I have become almost polished at refuting the lies that the enemy speaks to my mind surrounding my past, the affair, my husband's addiction, and the way I view myself. But there are two areas of my life that I have yet to learn how to "take every thought captive and make it obedient to Christ." (2 Corinthians 10:5) In fact, until Saturday during our most recent counseling session, I didn't even realize that I was holding back in those areas. The struggle I find comes in terms of my pain, and my emotions. I am ruled by both of them. They dictate what I do and how I feel, as well as how I react to life in general. The fact that I let my emotions control me, instead of me controlling my emotions, became crystal clear to me during our session with Tony. Since then, I have been in pain that has not let up. Really, for the last two weeks, the pain has been almost as bad as it was before the surgery. It's in a different place-my shoulders and upper back-but it is still very real and such a distraction. You may have noticed that I have been MIA with regards to writing. It is mostly due to the pain. What isn't due to the pain is due to being ruled by my emotions. I haven't felt like writing a complete post, and so I haven't. I started many, but either I couldn't sit and type, or this feeling of apathy would fall over me. Typically when I struggle to get my thoughts down, I know that whatever I am trying to write is not inspired by a word God has spoken to my heart. I can't be sure if these last two weeks I stopped in the middle of writing posts because of God, or because of me. I have never wanted this blog to be about me but about what God has done and is doing, so I just assumed the inability to clearly state what was on my heart meant that I just shouldn't write. Today, as I reflect back to not writing, I see clearly that the pain has gotten in the way once more. The pain has controlled my actions. The pain drives my emotions, and my emotions drive me. It's a vicious and ugly cycle that I do not intend to stay in. How I take the reigns and bring my emotions and pain under my control is a mystery. Recently, I heard James 1:2-4 as I had never heard it before. Instead of just hearing it in my mind, it touched my heart. It spoke to me. God spoke to me and assured me that, while it seems impossible, I can have joy in the midst of pain. Not only that, but perseverance through it will bring about a maturity that I desperately need. I'll admit that I find this concept of being joyful through the trials absurd. Trusting that God will provide strength and comfort and peace seem simple when placed beside finding joy through the difficult times. So, while I don't question the presence of the pain, I struggle to be joyful BECAUSE of it. I've often wondered how God will be glorified through it, and have not received an answer on that yet. Maybe the only lesson here is that the pain is here to teach me what it really means to have joy and be thankful for the pain. Doesn't that sound crazy? And yet, I know it is what God has called me to. He hasn't given me a play book on how to practically put this into action. Instead, He has asked me to trust Him and rely on His strength. Step into another day, put one foot in front of the other, and just keep moving forward. 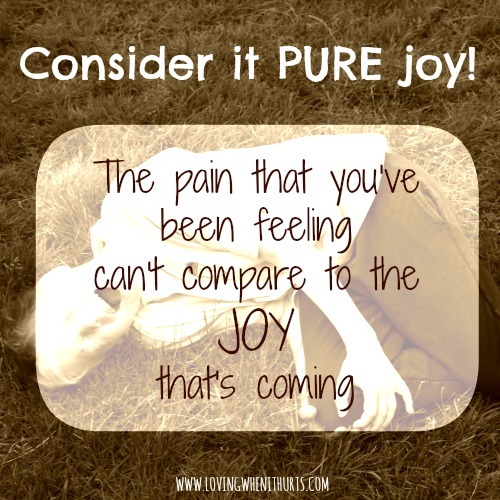 Pain and raging emotions are no excuse for not being joyful. This is new for me, and a lesson that I pray will be easily learned. I realize now that when I think about the pain, or when I am feeling depressed/hurt/angry/frustrated, those too I need to take captive and make obedient to Christ. If I am surrendering the other negative thoughts and lies, there is no reason why I should hold on to those thoughts that surround me in the midst of my physical pain or crazy female hormones. So, my new goals are to refuse to let my emotions control me, and take captive my thoughts about the pain and make them obedient to Christ, so that I am able to find the joy in the pain.